"All Together Now," offers guests a luxury Arrowhead Resort cabin in Pigeon Forge, Tennessee. This cabin provides guests with comfortable amenities and a convenient location for large families or groups. This cabin gives guests ample sleeping space as well as room to socialize on a Smoky Mountain retreat to remember. 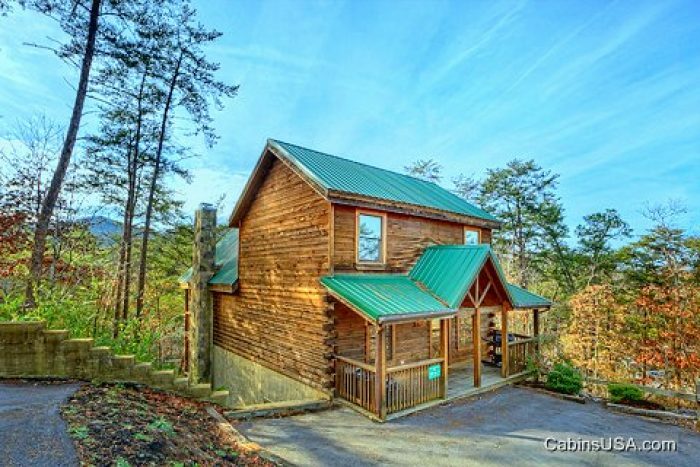 This oversized 3-story cabin near Downtown Pigeon Forge boasts a luxurious cabin interior with leather furnishings in the main level living area as well as 5 handsomely decorated bedrooms with elegant bedding. In addition to the main level's spacious living area with a dining area and plenty of seating, the second living area is located downstairs next to the game area, which features a pool table and multi-game, sit-down arcade game. The game area also features a media room area with rows of theater seating and a 75" TV. In addition to a welcoming interior, guests can enjoy plenty of space to enjoy the great outdoors in the Smokies. Enjoy summer fun at the resort swimming pool. Take in relaxing scenic views from the cabin’s year-round hot tub or one of several rocking chairs on the covered deck. Host a family cookout on the grill for a meal in the mountains to remember. When it's time to turn in for the night, this cabin boasts plenty of sleeping space. Both living areas offer guests sleeper sofas. The 5 bedrooms of this cabin in Arrowhead Resort gives guests 3 king and 2 queen beds to choose from. Each of the queen bedrooms also contains a twin-sized bunk bed. Large church groups or family reunions can stay close together in Arrowhead Resort Pigeon Forge Tennessee! "All Together Now" is located adjacent to "A Romantic Journey" and "Royal Romance" and is also only two cabins down from "Almost Heaven" and "Double View Lodge." In addition to convenient cabin grouping, large families and groups will appreciate how close this cabin places them to the live dinner shows, outlet shops and dozens of big attractions located along the Pigeon Forge Parkway. Stop your cabin search today and book your own Arrowhead Resort cabin with "All Together Now!" Book online and enjoy a 15% online booking discount.